The pristine motor yacht CasaMar offers the perfect blend of modern luxury and classic yachting style. 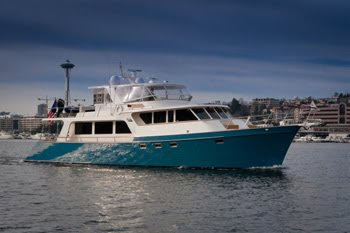 A highly regarded Marlo Explorer, she is a solid, safe, and seaworthy vessel. CasaMar’s interior is elegantly appointed with teak paneling and cabinetry as well as handsome decorator fabrics and upholstery. Throughout the yacht, guests enjoy a Bose Sound system, satellite TV access, and VCR/DVD/ CD players. The main salon features a large wrap-around sofa complemented by a teak coffee table and comfortable swivel chairs, plus a bar with barstools. The salon’s entertainment center includes a stereo and 42-inch TV. There is also a wine cooler and a printer that can be plugged into guests’ computers. The dining area is just forward of the salon. Up on the flybridge, a beautiful teak bar with seating for five offers a delightful spot for cocktails and more casual dining. All three of CasaMar’s spacious staterooms have flat-screen TVs and ample closet and drawer space, plus ensuite bathrooms/showers with granite or marble countertops, full-sized vanity sinks, and generous under-sink storage. The gracious master stateroom, which has a king bed, is flanked by his and hers bathrooms. The large VIP guestroom, forward, offers a queen bed, while the third stateroom has roomy twin beds. A large table in the aft cockpit offers a third choice for dining, while a convenient swim ladder and swim platform make it easy to enjoy the water. For trips ashore, CasaMar’s 14-foot Avon tender is equipped with a 60-hp outboard.